Whereas the Nazi exhibition “Entartete Kunst” has after the war several times been reconstructed (in Berlin, Munich and Düsseldorf), the music exhibition of Düsseldorf 1938 was nearly forgotten. Nobody seemed to remember that this industrial town on river Rhine was designed to be the second musical center of Nazi-Germany. Peter Girth, formerly executive director of the Berlin Philharmonic, then musical director of the Düsseldorf Symphony Orchestra, initiated the reconstruction of this “Degenerate Music” exhibition. Besides the reconstruction the new exhibit discusses the destruction of the musical life of the Weimar republic. It also tries to give an overview of German musical life in the Thirties, including the “research” of prominent German musicologists on racist topics as presented in Düsseldorf in 1938. The new exhibition opened in 1988 to commemorate its 50th anniversary in the Tonhalle, the main concert-hall of Düsseldorf. It traveled around Europe, to more than 40 cities, including Düsseldorf, Frankfurt, Vienna, Zurich, Berlin, Amsterdam, Hamburg, Munich, Bremen, Nuremberg, Cologne, Stuttgart and Dresden. This exhibition (plus catalogue and documentation of sound) should belong to the intellectual luggage of everyone, who today is dealing with music of these times and wants to be watchful, that “Entartung” will remain a term, that belongs to the past. The American version, created for the Los Angeles Philharmonic Orchestra, has been shown at the Dorothy Chandler Pavilion of the Music Center Los Angeles (1991), at the Bard Music Festival New York (1992), the Brandeis University Boston (1994), the Royal Festival Hall London (1995/96), at the Auditori Concert Hall in Barcelona (2000), in Miami (Symphony of the West, 2004/05), at the Ravinia Festival Chicago (2005) and at the Tel Aviv University (2011). 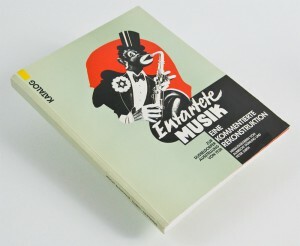 f) the documentation of sound “Entartete Musik”, consisting of four CDs, with booklets in English. (80 minutes) has been produced with support of the City of Düsseldorf and the Kulturstiftung der Länder (German National Endowment of the Arts). Emigrants like Ernst Krenek (Vienna/Palm Springs), Herbert Zipper (Pacific Palisades) and Berthold Goldschmidt (Berlin/London) are being portrayed. English video version (VHS) with subtitles available. “Degenerate Art” and “Degenerate Music” are extremely important and timely exhibitions. ANGELES. THE ART OF LIVING IN L.A. The exhibition’s posters vilify composers whose music, in the Nazis’ views, did not represent pure German values and would corrupt the morals of children. Music lovers are exhorted to reject those dangerous currents and protest against them. A visitor taking in the exhibition just two days after the Republican National Convention could not help but notice a similarity between this rhetoric and that of the American right wing. That some of the abused composers have now been restored to concert and record circulation – Ullmann, Schulhoff, Krasa – is a tribute to this exhibition.